Following what may have been something of a slump in Monamy's fortunes in about 1733, the new outlet provided by Vauxhall Gardens in 1736 for exhibition, and what in modern terms is called "marketing", would have helped to revive his celebrity. The outbreak of war in 1739 provided a number of popular and topical subjects to display. The initial successes were not followed through however, and after setbacks, not least the symbolic loss of the Victory in 1744, it was clear that England was on course for a long hard struggle. The tide did not begin to turn until 1759, ten years after Monamy's death. The draconian execution of John Byng must be regarded as a significant factor in the stiffening of English resolve. In spite of his increasing age, "decay" and "infirmity", and in spite of competition from Scott, Monamy can be seen as the public war artist of this period, until about a year before his death in 1749. For an account of the Vauxhall Gardens paintings, see here. 9/7. Edward Vernon (1684-1757) promoted to Vice-Admiral. 20/7. 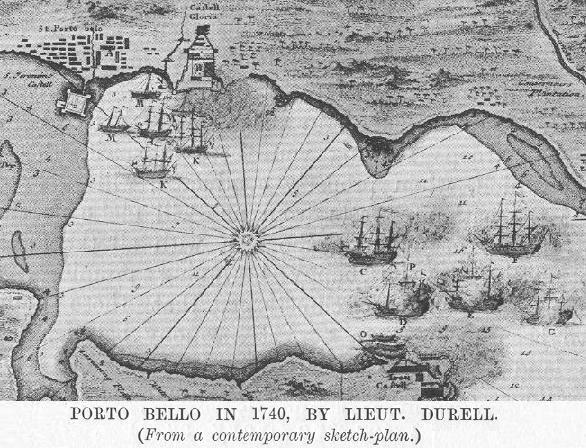 Walpole allows Vernon to embark for Porto Bello. He sets sail. 23/9. Capture of the San Joseph, a Spanish Carracca ship, by the Chester and Canterbury. 23/10. War declared against Spain, ie after the taking of the San Joseph. War later merges with War of Austrian Succession. 21/11. Porto Bello captured by Admiral Vernon. 12/3. Report of Vernon's success reaches London. 8/4. 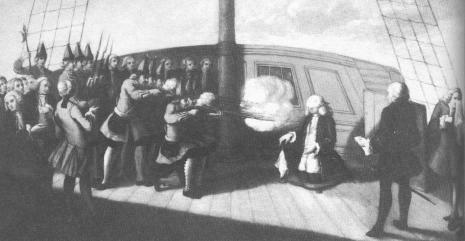 Capture of the Princesa, 64, by Captain Thomas Durell, in the Kent, Captain C.Mayne in the Lennox, and Captain Lord Augustus Fitzroy in the Orford. 18/9. Anson, in the Centurion, sails on voyage of circumnavigation. 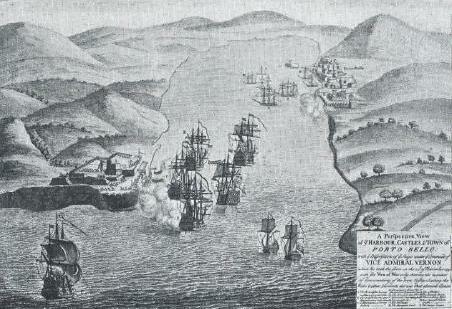 23/3 Attack on Cartagena by Vernon. This was a successful action, but the enterprise was abandoned later, Brigadier-General Wentworth failing to second Vernon with his siege troops. (March to May). 1st April, Vernon reported his success back to London, but the rejoicing was followed by disillusionment. 17/5. Vernon's withdrawal from Cartagena. 20/4. 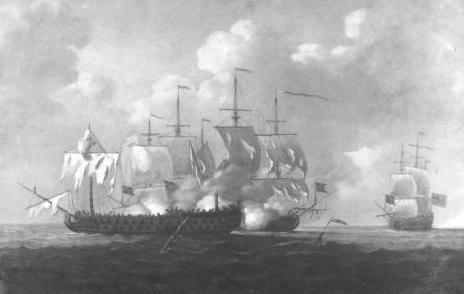 Commodore George Anson in the Centurion took the Acapulco galleon Nuestra Senora de Cavadonga, worth £400,000, off the island of Samar. 11/2. Matthews' engagement off Toulon. 8/5. The Northumberland, Captain T.Watson, while cruising off the Rock of Lisbon, was captured by the French ships Mars, Content, and Venus. After Watson was killed, the master struck the ship's colours. Casualties were 48 English dead and wounded, 130 French killed and wounded. The master was later sentenced by court-martial to Marshalsea prison for life. 4/10. Loss of the Victory, off the Casquets. Balchen and 1100 men drowned. Click here. 9/7. The Lion, 50, fought a severe action with the French ship, Elizabeth, 50, escorting the Doutelle. Monamy's painting of the Lion, from Jersey stamp, 1971. 17/6. 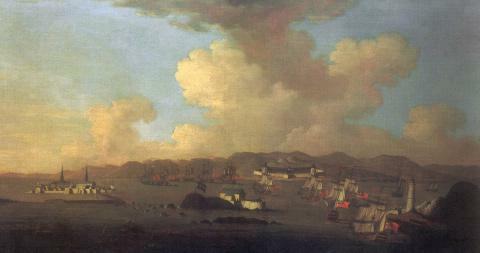 (28/6 NS) Capture of Louisbourg, Canada. Captain Philip Durell, Eltham, 40, was present with Warren at this occasion. For versions of painting below, click here. Louisbourg. Signed. 27½ x 52¾. Captain George Walker in action against French. For more about this remarkable man see here. 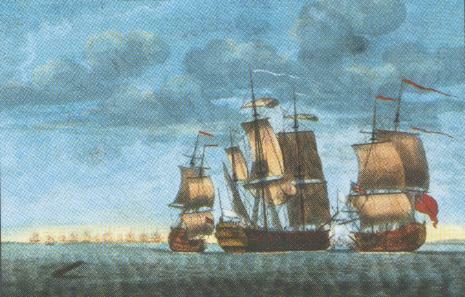 The Prince Frederick and Duke privateers took the Marquese d'Antin and the Louis Erasme. 10/4. The Alexander, 20, Captain Phillips, captures the Solebay, previously taken by the French from the British. 25/6. 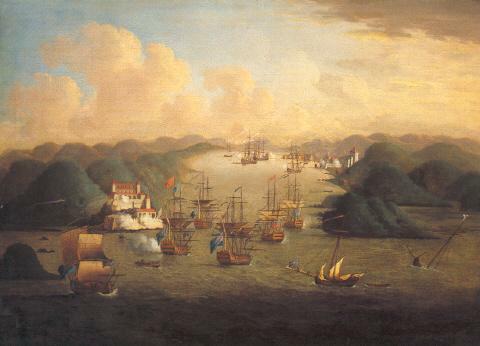 Peyton's action with La Bourdonnais off Fort St.David. 20-30/9. Lestock's expedition to L'Orient. 11/10. Nottingham, 60, Captain Philip Saumarez, took French ship Mars, 64, off Cape Clear. 3/5. Anson's victory over de la Jonquière off Finisterre. Philip Saumarez, Nottingham, present. 9/10. Glorioso, 74, taken by Russell, 80. 14/10. 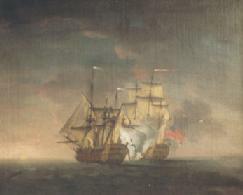 Sir Edward Hawke's victory over M.de l'Etenduère off Ushant. (Finisterre?). Philip Saumarez, Nottingham, 60, killed; also present was Capt. Philip Durell, Gloucester, 50. 31/1. Nottingham, 60, and Portland, 50, took Magnanime, 64. 8/5. Rear-Admiral Sir Charles Knowles reduced Port Louis, Hispaniola. 1/10. Knowles's victory off Havana. 18/10. Treaty of Aix-la-Chapelle. Louisbourg restored to France. 7/2. Burial of Peter Monamy at St Margaret's, Westminster. 27/7. Peter Monamy's effects (Household Furniture, Pictures, China; Prints, Drawings, Ship Models) sold at auction, by distraint, ie forcibly in order to recover debts. Date (?) of publication of two engravings: Nottingham takes Mars [Parr after Monamy/Swaine]; and Capture of the Capodonga [Parr after Swaine].